In this project, the designer needed to create focal points over the columns dividing the alleys in a bowling club. 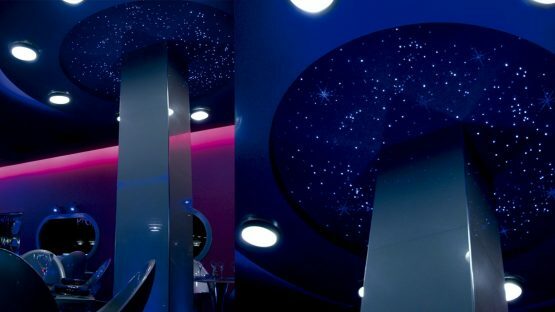 The solution chosen by the team at Real R was a twinkling starry sky crafted with small diameter fibers to add a sensation of depth and perspective to the circular ceilings. HBF201, high performance 0,50mm bare fibers driven by MHI302 modular halogen illuminators with 100W halogen lamps and oscillating starry sky shutter disks.